In 1979, concerned family members banded together to fulfill a critical need at that time: to develop safe, decent and affordable housing linked with support services for their offspring afflicted with a disability. In 1985, Triple C purchased our first group home to serve 5 individuals discharged from state institutions; and now, 40 years later, we support over 240+ individuals and families…and growing more opportunities each and every day! The ability of Triple C to provide broad based community supports and develop safe, affordable housing opportunities offers individuals and families a wide array of options in a variety of settings. This flexibility in choice has enabled Triple C to attain a large measure of success with matching families to housing opportunities, and individualizing support to achieve housing stability, self sufficiency and overall wellness. Additionally, a high level of sustained community tenure with very low housing turn over is largely due to the development of tenant operated housing for individuals whose residential options are so limited. The need in New Jersey is acute. For most individuals of very low income, it is impossible on such limited financial resources to secure a safe, permanent and affordable place to live. Since its inception, Triple C has continually identified the need to create more affordable housing opportunities to fully integrate individuals, families and veterans in safe and decent neighborhoods; and proactively attend to the unique, needs of persons served. As such, Triple C has maintained a steady stream of housing development linked with enhanced support services to respond to the growing needs of the community. 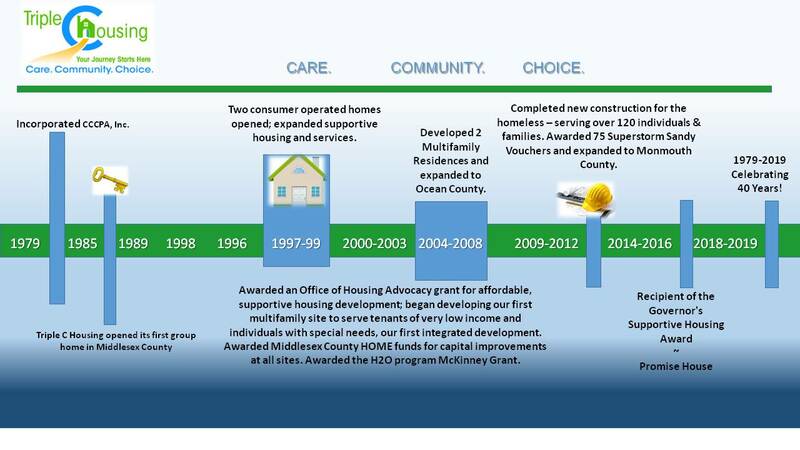 2019 is marking a very special milestone in Triple C’s history as we honor our 40th anniversary of fulfilling our mission of “creating permanent supportive housing opportunities coupled with innovative support services empowering individuals and families to live with dignity and fulfill their utmost potential.” By developing high quality affordable housing and providing community based support services, our most vulnerable citizens may break the cycle of homelessness or institutionalization, and find a place of their own to call home. Triple C is a well founded, grass-roots organization that has helped to make the dream of living independently with dignity become a reality for those we serve.